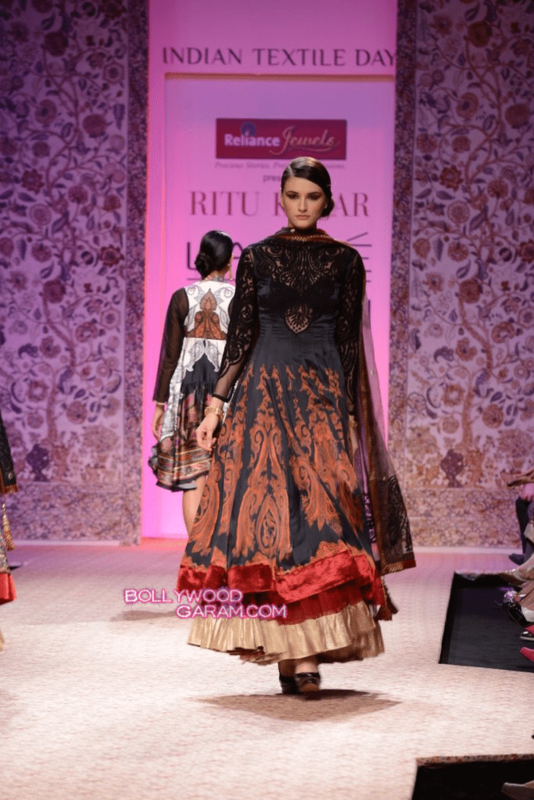 BollywoodGaram.com: The 2013 Lakme Fashion Week (LFW) Day 4 saw an exotic vintage collection by Padma Shree Ritu Kumar, which was presented by Reliance Jewels. Kumar is famous for her in-depth research of various Indian textiles and crafts. Her collection at the event was called The Thunder Mountain and The Curling Vine and showcased several colors, weaves and styles on the runway. The collection of the designer was inspired by the serene mountains of the Himalayan region and her designs matched the beauty of nature from these regions. Kumar’s collection included some weaves, which were converted into prints and the fabrics used ranged from woven to silk shawls in rich deep tones which resembled the beauty of the hilly states. 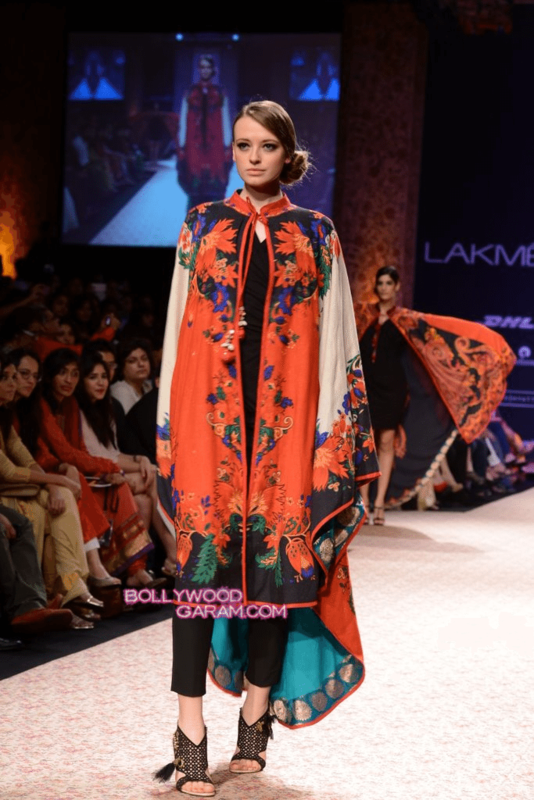 Some of her designs also included the long-sleeved coat dresses which featured a mix of prints and embellishments and kurtas, which had the Himalayan flavor. The collection also included kira – which is a wrap around skirt from Bhutan – dresses, wrap jackets, capes and kaftans were seen creating an unconventional impact on the catwalk. The stunners at the show were three dramatic giant printed and embellished capes which appeared in quick succession on the runway. 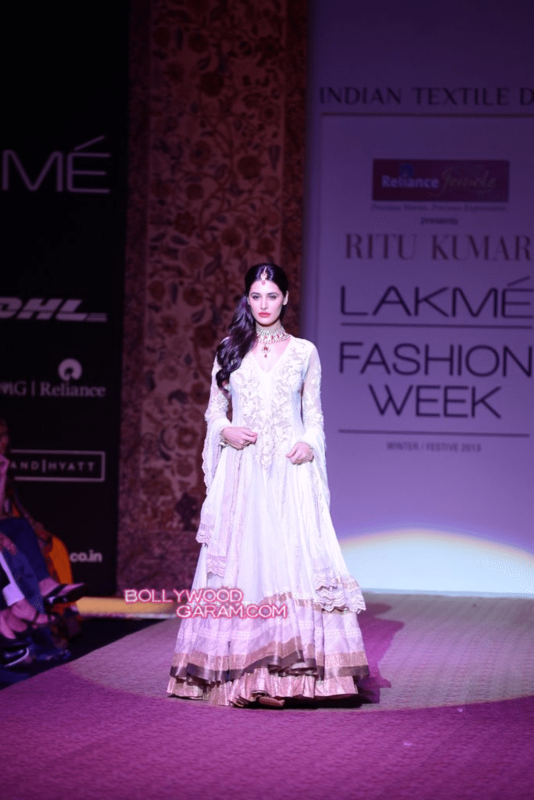 Towards the end of the show, Bollywood actress Nargis Fakhri walked the ramp as the showstopper, while she showed off a diamond polki set with a white fully embellished kalidaar kurta and dupatta.